This is the inspiration chart I used, but I don't think I used any of the products that are listed on the sheet. I used similar ones, which is what you can do if you decide to try this look. All you really need to do is get the colors close to the picture, and it turns out great. For the eyes, I started out with a primer. I use Bare Escentuals, but any eye primer will do. Next, I lightly applied a blue cream shadow to the outer half of my eyes, just to make the color brighter. I then applied MAC eyeshadow in Electric Eel (or any bright blue) on my crease and slightly above, out towards the corner of my eye. On my eyelid, I applied a light pink loose shimmer, and blended it with the blue. I also put the shimmer in the corner of my eye, along with an off white solid shimmer (MAC Nylon). I lined my eyes with solid black (MAC Carbon), and lined the bottom with the bright blue. I lightly swept an off white shimmer under the brows, and blended. 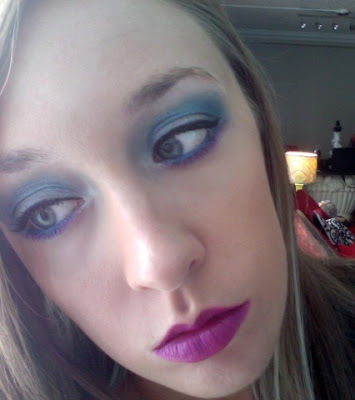 Lastly, I put a very bright purple under the blue liner on my bottom lashes. I used a bright shimmery purple from my Coastal Scents palette. Two coats of Maybelline Great Lash finish the eyes. I apply my foundation and concealer after my eyeshadow, so the fallout from the shadow will not stick to my skin. I use MAC Studio fix, and set it with MAC Mineralize Skinfinish. I then conditioned my lips with classic Burt's bees, and applied MAC Venomous Villains in Maleficent. The cheeks are a shimmery dark pink blush, MAC Style Demon.